If you like short stories, mine were greatly influenced by Bret Harte and O. Henry. I like a twist at the end. I’ve listed below the characteristics I think make a great story, whether it is short or long. Writing short stories can also lead to longer works, when the characters need more room for their stories it just makes sense to give them a book. 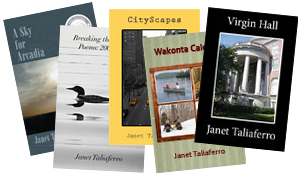 My writing follows passions, politics, and life experiences. Perhaps it’s the poet in me, but setting is important in all my work. I want you to see, hear, and smell the place. All three novels are set in the Southwest, because that is where I was born, grew up, and have lived during a large block of my life as an adult. My first collection of short stories and much of my poetry reflect all the summers since I was eight years old spent in Northern Wisconsin—Up North, as it is known. That first collection of stories, Wakonta Calendar, was my Master’s Thesis and won the Geoffrey Bocca Memorial Award for Graduate Writing. It is a calendar consisting of twelve stories, each laid in one month of the year and all taking place in the same small town in Wisconsin. The second collection is only a reflection of place. Two of my three children lived in New York City for a number of years during the 1980s. From my visits there, I absorbed a lot of the local color, since they lived in such exotic places as Brooklyn and Queens while working in Manhattan. Also, editors and agents are inclined to like New York stories. As I added to the collection over the years, the result was entitled CityScapes, but had little to do with New York itself. Three of these stories were later published in The Northern Virginia Review. Writing speech becomes part of setting, and I’m careful about how my characters sound. My daughter and I nearly fell out of our seats laughing the first time the characters in the Coen brothers’ “Fargo” opened their mouths. The accent was so familiar. Speech patterns, word usage, and cadence are as important to my writing as the description of a room or street. Writing to create atmosphere encompasses the physical and the ephemeral. While setting is essential to telling the story, time is arbitrary. In looking over my work, I find that my writing is very “calendar bound.” Both my first collection of stories and my first novel cover exactly a year. Another novel (in-progress) is proscribed by a four-month slice of history about World War II, and still another is primarily about a freshman year at college. Previously I mentioned how I build a character in my writing. Once given a background, characters have a way of revealing themselves, not only to the reader but to the writer. One of the things I didn’t realize until after I had written the first two books is that I always have at least one African American character, and often they serve as the raisoneur, commentator, or chorus. Unconsciously this reflects my belief that if you don’t know the African American experience, you don’t know American culture. Sometimes when you write, you learn as much about your own character as the ones in your work.